Many Modernistic team members and customers share their homes with beloved pets. We love their companionship, but sometimes they do things we can’t stand! For a variety of reasons, cats love to scratch, but how can we keep them off of our furniture? Does your cat get enough exercise, entertainment, playtime, attention? Cats have a pretty small world they live in everyday. Without your attention, plenty of toys, and scratching surfaces, they will look for other way to get their energy out. Are you taking care of your cat’s nails? In the wild, cats would be climbing trees, walking on the rough ground, and scratching many surfaces that would help keep their nails trim and in good shape. Living in a cozy human home means they don’t have these natural opportunities to scratch, meaning they will be looking for your best tree and ground like surfaces. Do you have surfaces specifically meant for your cat to scratch? Cats have a primal instinct to scratch, so you won’t be able to stop them. You can, however, make sure they are scratching appropriate “cat” objects. Your furniture is usually out in the open, what about the cat posts? Cats like to leave their visual and scent markers in a spot where everyone can see and smell them – What use is marking your territory if no one notices? Putting a scratching post in a back corner is a good way to hide it out of sight of company, but it is also making it less attractive to your cat. 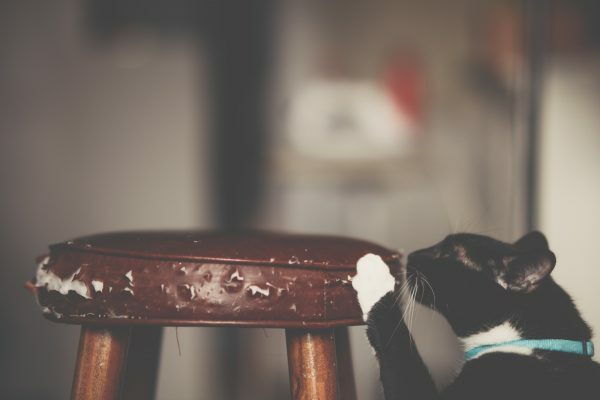 So, what steps can you take to stop a cat from scratching your furniture? Make sure you provide a variety of scratching substitutes, such as cardboard, rope-wrapped posts, and carpet. Don’t hide the scratchers away, put them right out in the open. Place a new scratching post right by the piece of furniture your cat likes to scratch. Give treats for scratching the new post. If your cat responds well of catnip, add some to the new post. There are deterrent sprays and sticky pads you can add to your furniture. Keep in mind, if you only add the deterrent, but don’t have enough appropriate scratching objects, your cat will keep scratching your furniture. Spend some quality time playing with your cat, trim her nails, and she should be content scratching the new scratching objects. If, after all this, your cat is still more interested in your furniture than her posts, speak with your vet for professional advice. Since 1973, Modernistic has been cleaning up after Michigan’s pets on carpet, upholstery, tile and grout, and hardwood! Call or click today to see how we can help you with your pet messes. At Modernistic, we like clean carpet. That’s right, I said it. Go ahead and take a moment to absorb that declaration… Good. Now that it’s had some time to sink in, let me explain. We don’t clean carpet because of the fabulous riches that come with being a cleaning company. We clean carpet (and upholstery, and air ducts, and tile) because it’s the best way we know how to bring delight to our customers. Having a clean home makes people happy, and keeping a clean home helps keep people happy for longer. You know what doesn’t make people happy? Spots and stains. Especially spots and stains that appear on carpet and upholstery that previously didn’t have spots and stains! Since we’ve been in the business of keeping our customers happy since 1973, we’ve learned that the best way to protect carpet from stains is applying 3M Scotchgard protection after every professional cleaning. What Does 3M Scotchgard Do? 3M Scotchgard protection creates a barrier on your carpet and upholstery, helping prevent liquid and soil from absorbing into the fibers. It’s an odorless, invisible application that makes spills and dirt bead up at the surface of your fabric, making it simple and quick to clean up messes. What Does 3M Scotchgard Smell Like? Absolutely nothing! Scotchgard is designed to be odorless, so nothing gets in the way of that “freshly-cleaned” smell. Ok, Then What Does It Feel Like? Again, absolutely nothing. 3M Scotchgard won’t affect the texture of your carpet or upholstery in any way (save being slightly damp when first applied). 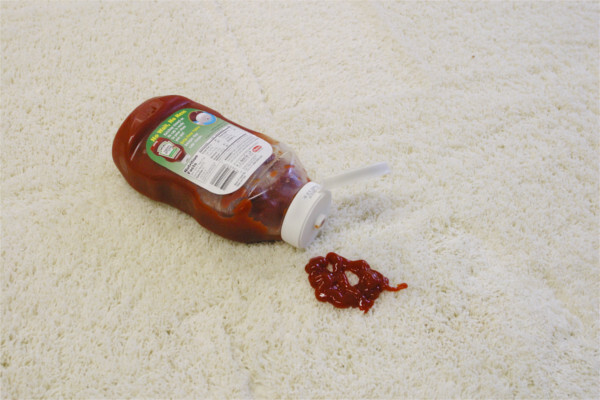 Once it dries along with your freshly-cleaned carpet, you won’t even know it’s there – until you spill something on it! So How Do I Know It’s Working? 3M Scotchgard will make liquid bead up on the surface of the fibers, giving you more time to clean up after a spill. Also, vacuuming will remove much more dirt and soil than before, making your regular cleaning chore much easier! How long 3M Scotchgard will last on your carpet or upholstery depends on a few factors – like foot traffic, usage, and cleaning schedule – but a good rule of thumb is that you should get it cleaned and reapplied every 6 months for optimal protection. The best thing about 3M Scotchgard is what it does for the longevity of your carpet. When you compare the cost of applying protectant vs the cost of replacing your carpeting sooner than you have to.. Well, let’s just say you’re saving PLENTY of money going with Scotchgard! So the next time you get your carpets or upholstery professionally cleaned, make sure you ask about the best way to protect carpet from stains – 3M Scotchgard! Modernistic has been protecting Michigan carpets since 1973. If you’d like to learn more about how you can protect your home, click or call today! At Modernistic, we love our pets! And we know that many of our customers love their pets too! But it can be frustrating trying to keep up with all of the pet fur that get caught in upholstery and carpet. If your pets are anything like ours, you may feel like you need Modernistic to clean your carpet weekly to keep up with all the shedding! Fortunately, there are a few Simple and Quick ways to get pet hair out of carpet and upholstery that you can do at home. With tightly woven fabrics and short fur, a light spray of water and fabric softener and loosed up pet fur. A cloth or paper towel can lift much of it right up. A slightly dampened sponge can also be used to lightly pick up fur. May people like to use lint rollers, just like they use on their clothes. We know many pet owners already keep lint rollers on hand, which makes them the perfect tool to keep up with the fur. Alternatively, you can wrap duct tape or packing tape around your hand and use it to lightly lift any fur just like a lint roller. If the fur is still stubbornly sticking to the upholstery fabric, a rubber glove might help. Dampen a rubber glove with water and simply run your hand over the surface. Repeat until the hair is removed. For carpeting, some people will use a rubber soled shoe in place of the glove method. But the rubber should only be needed for extra stubborn fur. The best way to get fur out of carpet is to keep up with it by vacuuming regularly, and going over those furry areas in alternating directions. Remember to regularly vacuum your upholstery as well! Gadgets! There are rubber gadgets that work on the same principle as the rubber glove method that work great at getting fur out of upholstery and carpets. Some are small, handheld or glove shaped, and others are large brooms. There are also pet hair removal gadgets that look like paddles covered in fabric. These tools use static electricity to their advantage, and come with a self cleaning base. They work a lot like a lint roller, without the waste caused by disposable adhesive sheets. Cleaning up pet hair can seem like a lot of work, but the secret is keeping up with it regularly with these Simple & Quick ways to get pet hair out of carpet and upholstery. A little bit of cleanup here and there every day will help get rid of all the unsightly shedding! Modernistic has been cleaning up after pets since 1973. If you need a hand cleaning up after your furry friend, then trust the cleaning experts and give us a click or call! Everybody knows their carpet and tile floors need regular cleaning, but sometimes we can forget about where many of us spend so much time when we’re home: our furniture. The couches, chairs, and other upholstered items in our home get used every day, but they’re not as easy to clean as vacuuming the carpet in the living room or sweeping the kitchen tile. While there are handheld vacuums and attachments to get the surface dirt off the furniture, but just like carpet, upholstery needs regular professional cleanings too. Here’s the thing: different upholstery fabrics need different types of cleaning! Virtually all carpeting can be professionally wet cleaned, but the same rule does not apply for furniture. Some upholstery can only be cleaned with a dry solvent, and other pieces are only recommended to use a vacuum and/or a light brushing. So how can you figure out how to clean upholstery the correct way? Upholstery cleaning codes! Almost all pieces of furniture will have upholstery tags (usually located on the underside) that will tell you specifically what cleaning method the manufacturer recommends. However, they are listed as codes that aren’t always the easiest to read. So, what do the codes mean? There are three common codes found on furniture made in the U.S. The first is W. This code means your furniture can be cleaned with water-based cleaning solutions, like a professional truck mounted extraction system. This type of cleaning delivers the best results, especially for stains. The second of the three common codes is S. This stands for solvent cleaning. Solvent cleaning is a dry-cleaning method and can remove surface dirt but isn’t quite as successful at removing food or drink stains. The last of the three common cleaning codes is X. This means the material or filling of the upholstery is sensitive enough that it is recommended to be vacuumed only. Wet and dry-cleaning methods might damage, discolor, or shrink the furniture. So, what do you do if your furniture doesn’t have any upholstery cleaning codes? If you know where you purchased the furniture, you can call the manufacturer and ask them directly. If that’s not an option, you can always have a professional upholstery cleaning company come out and determine the safest and most effective way to clean your upholstery. Modernistic has been checking upholstery cleaning codes and providing the best furniture cleaning service in Michigan for over 45 years! If you have questions about how to best clean your furniture, click or call to learn from the experts! You’ll Be Shocked How Dirty Your “Clean” Chair Really Is! We sit on it, lay on it, play on it, and even eat on it. So why do we think it doesn’t need to be cleaned as often as our floors? Your furniture can collect just as much (sometimes even more!) dirt and soil as the floor. Even though it may look clean, upholstery can hide all sorts of nasty stuff you can’t see with your naked eye. Don’t believe us? Try the White Towel Test for yourself! At Modernistic, we have all sorts of tricks up our sleeve to get your home clean, but this one is a eye-opening test to show you how much you need your upholstery professionally cleaned. Our White Towel Test is a sure fire way to show you what you’ve been unwittingly sitting on. All we do is utilize four key elements to show you the dirt and soiling that you and your family may be lounging on. 1.) A white towel (preferably one of ours to save you the extra dirty laundry). 2.) A piece of seemingly-clean upholstery in your home. 3.) A trained and certified Modernistic Technician. 4.) A Modernistic truck-mounted vacuum system. When you get all 4 of these things together, you’ll see that what you thought was clean upholstery is definitely NOT so clean. The Modernistic White Towel Test is one of the easiest ways to see all the dirt you may be leaving behind when you think your cleaning is done. We place a simple white towel between your upholstery and our powerful truck-mounted vacuum equipment. Next, our technician will run the vacuum across your upholstery. The white towel acts like a filter and will reveal the soiling hiding in your upholstery. You will be surprised at how much dirt you can’t see on your sofas, chairs, ottomans, and sectional seating. The proof is in the pudding! That’s why, when you want to get your upholstery truly clean, you need the professionals at Modernistic. Many people believe they can easily clean their upholstery themselves, but as the White Towel Test proves, no cleaning method in the world can compare to the power of a truck-mounted hot water extraction. Not to mention all of the different types of upholstery fabric there are today; it takes an experienced hand to use just the right amount of water and pressure to avoid damaging delicate fabrics! Dust mites, microbes, and other contaminants will invisibly accumulate in your upholstery over time, so if you want to see your furniture cleaned right, then hire a professional like Modernistic. You bring the upholstery, and we’ll bring the white towel! Suede, velvet, chenille, and other upscale upholstery can add class and style to any room. Leather and even cotton or linen can have a similar effect. But without proper maintenance, the fabric can begin to fade. With just a little effort, you can keep your couches, chairs, and sofas in peak condition for much longer. Here are some tips to help you prolong the life of your luxury furniture. 1. Clear out and vacuum regularly. Weekly, or as often as you vacuum the floor, vacuum your upholstery as well. Start by pulling out the cushions and gathering any coins, crumbs, paperclips, or other debris that’s fallen through the cracks. Then, vacuum the cushions and fabric surfaces, paying special attention to crevices, ridges, and other small areas. Any loose dirt that’s sitting on the surface can get ground deep into the fibers if it’s not removed soon, so regular vacuuming is important. Be sure your vacuum attachments are clean, so they don’t leave extra residue on your fabric. 2. Fluff the cushions and pillows. Since cushions are full of stuffing, they are susceptible to shape-shifting – especially because they carry weight in the same place. Nobody wants their cushions to go limp and flat, and fluffing can help them retain their shape. Fluffing can include punching, squeezing, shuffling, or anything that will force the stuffing to move around inside the cover. At a minimum, plan on spending a couple minutes fluffing your cushions and pillows every few days to keep them in their best shape. 3. Flip and rotate the cushions. Cushions take all their wear in the same place, so if you flip them and switch them around, you can even out the wear and extend the life of the fabric. Depending on the shape of your couch and cushions, you may be able to simply flip them upside-down and switch them with each other. Some couches have T-shaped cushions, which you can invert and move to the other side of the couch. 4. Protect your upholstery from sunlight. Direct sunlight can affect your furniture’s fabric like it can affect your skin, so it’s important to protect it if you want to prolong the life of your luxury furniture. If you want to place your furniture in a room with lots of natural light, consider using a slipcover to protect it from the sun. Throw blankets, which come in a wide variety of colors, fabrics, and styles, provide protection as well. If your furniture’s fabric looks great and you want to show it off, you can still protect it from sunlight. When you’re away or not using the room, close the curtains or throw a sheet over the sofa. This will keep the fabric looking new when you do use the room. 5. Make house rules to keep your furniture clean. Food, crayons, and pet accidents can have disastrous effects on your furniture, so make rules to mitigate that danger. Depending on how your household runs, rules could include prohibitions on juice and wine or all food in the living room. You could allow adults but not children to eat in the living room, or have your children keep their art supplies in a different room. 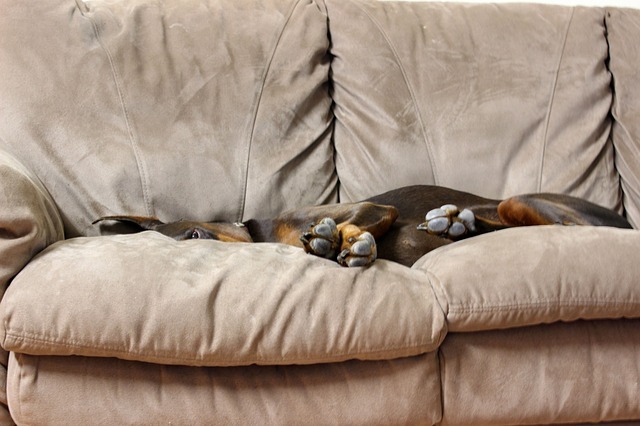 Dogs can be trained to stay off furniture. 6. What can you do about pets? You love your cat or headstrong dog that likes to snuggle on the couch, but you also love the great look your furniture brings to the room. So what can you do? If you can’t trust your pets to stay off the furniture, Emfurn.com advises that it’s probably a good idea to cover the couches and chairs, especially when you’re not around to supervise. House training accidents, dander, fur, and mud tracked in from outdoors can dirty the upholstery, and claws can get easily snagged in delicate fabric. 7. What if I spill or dirty the fabric? Spills and accidents happen. When they do, clean up the mess right away, taking care to blot more than you wipe. Be careful with any cleaning agents, since every piece of upholstery is unique and it’s not always possible to know what to expect. If you do opt for a commercial cleaning chemical, always spot-test in an inconspicuous area first. However, when it comes to upscale upholstery, your safest bet is to contact a professional. At Modernistic, we know exactly how to treat specialty fabrics. With immediate care, we can get rid of almost any stain, saving your fine furniture for years to come. 8. Prolong the life of your luxury furniture with professional care. An annual or seasonal deep cleaning can prevent dirt and grime from becoming a permanent part of your upholstery and extend the life of your furniture. Since deep cleaning can be a complex process, it’s best to call a professional. Professional cleaning is also key to removing stubborn stains or discoloration from regular use. It’s easy to schedule a professional cleaning with Modernistic, and our coupons can help make it even more affordable. We’ll help you keep your furniture clean, comfortable, and looking great. Contact us today to prolong the life of your luxury furniture. Serving Rockford, MI for 40 years. Leather furniture has long been a popular furniture choice in most homes. A tightly-upholstered leather chair can provide a clean, classic finish to a room, whereas a soft leather sofa can become the favorite comfort couch. However, leather requires some special care to keep it in good condition. Here are our top tips to help you care for leather furniture. In general, leather furniture is very easy to maintain. Simply wipe the furniture down with a dry cloth as part of your regular cleaning routine to eliminate surface dust. 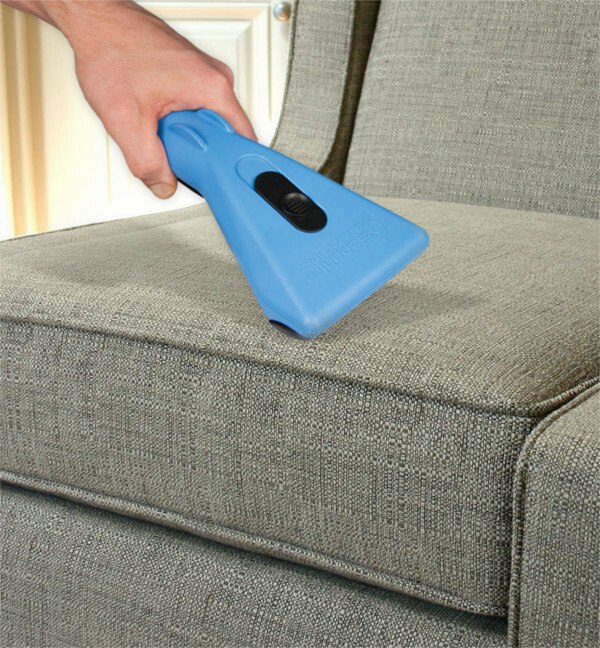 You should also vacuum in the crevices of the cushions and arm rests where dirt, dander, pollen, and other debris can become lodged. Do not use any cleaning products not designed specifically for leather, as even gentle products can damage the leather. Regular conditioning is an essential part of proper care for leather furniture. Leather dries out over time, and when it does it can crack and tear. Accordingly, you should apply a leather conditioner once every six months or so, and more if your furniture is in a particularly hot environment. Spray or rub the conditioner into your leather as directed, and don’t skip parts you can’t see. If your leather cracks in a hidden area, it can lead to a larger tear. Use as little water as possible when wiping up a spill. Ideally, you will be able to get most of the spill off with a dry cloth. However if the spill is a sticky liquid, or contains a dye which might soak into the material, you may need to resort to a dampened cloth. Take care not to soak the leather in liquid, as this will cause damage. And if you spill an oily substance, use a little talcum powder or baking soda to help absorb the grease. Leather will dry out and fade more quickly in direct sunlight. Instead of placing your leather furniture near a window, position it further within the room and keep the shades down during the daytime when you’re not at home. Modernistic can help clean your leather and other upholstered furniture, particularly in those deep down crevice areas where dander and allergens collect. Contact us today to schedule an appointment! When was the last time you cleaned your office upholstery? Bloomfield, could your office furniture use some TLC? When was the last time you cleaned your office upholstery? If you haven’t checked in a while, you might want to take a moment to see how it’s doing. Couches and armchairs in offices and reception areas are easy to overlook if you or your staff don’t use them often. But your visitors sit on them, and they notice. Here are a few steps you can take to better care for your office furniture and give your visitors an experience that reflects the true quality of your business. You probably have someone come in to vacuum and dust your office on a regular basis. Ask this person to vacuum your upholstery as well! Regular vacuuming keeps your upholstery from looking dingy. But it also prevents dirt and other debris from being ground into the fabric, which wears down the fibers. It also gives your cleaning staff an opportunity to keep tabs on how well the fabric is holding up. If it’s beginning to wear down in areas, they can let you know before your client does. This isn’t about hiding stains: turning your cushions regularly prevents them from wearing or fading unevenly. It also gives you a chance to fluff the cushions, which keeps them from going flat and developing lumps. You probably remember to bring in a professional to clean your carpets on a regular basis. Why not have them do your upholstery, too? Modernistic technicians have special tools to clean the hard-to-reach crevices of upholstery furniture. And they can help get that coffee stain out, too. By the time they finish, your office furniture will look like you purchased it yesterday. Contact us today to schedule a cleaning! How should you care for upholstered furniture? Hey Grand Rapids, how’s that old armchair looking? We all have that favorite sofa or armchair that we hope will last forever but has clearly seen better days. Whether you’re planning to order a replacement, or you just want to do what you what you can the extend the life of your current pieces, here are our suggestions for how you can better care for upholstered furniture. Most fabric comes pre-treated with stain resistant materials, but you may want to look into some slipcovers for extra protection if your furniture will see heavy use or if it’s kept in a particularly sunny room. No, this isn’t about hiding that stain. You want to make sure that both sides of the cushion receive equal wear, so that one side does not go thin before the other. Fabric also fades naturally from sunlight, so by turning the cushions regularly you can keep them fading at an even rate. By taking time to fluff the padding, you refresh its shape, prevent it from going flat or developing uncomfortable lumps. This will also help wrinkles from developing. Keep dirt and other contaminants from being ground into the fabric. This will not only make your furniture look dingy, but will wear down the fibers as well. Take care when vacuuming near buttons, loose threads, or weak spots in fabric. Use a soft brush nozzle on the cushions, and a corner attachment for the crevices. Blot up any spills or pet accidents immediately. Use only a small amount of cleaner, and make sure whatever you use is suited for the fabric type. The best care you can give your upholstered furniture is regular treatment from a professional. At Modernistic, we can be sure to treat your upholstery fabric with the correct cleaning agents, so as not to damage your furniture. We have special tools to help clean out hard-to-reach places, so that by the time we’re done, it will look as if someone has breathed new life into your beloved armchair. Schedule an appointment or get a quote today.